The trailer of Padmavati will transport you the 14th century when Rani Padmini walked in the fort of Chittor, so beautifully recreated by director Sanjay Leela Bhansali. 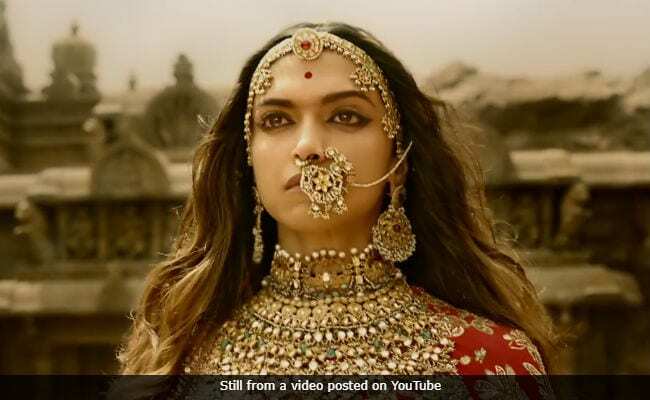 Deepika Padukone as Rani Padmini, Shahid Kapoor as Maharawal Ratan Singh and Ranveer Singh as Alauddin Khilji - Sanjay Leela Bhansali introduces audience to the three protagonists of his film in a three-minute clip. Like in the trailer of Bajirao Mastani, the trailer of Padmavati had minimal dialogues. Mr Bhansali let the background music and dramatic scenes do the talking. The film will depict tension between the Rajputs and the Khilji dynasty ruler. The first trailer of Padmavati presents glimpses of each character, showing their strength and weakness. The promotional material for Padmavati found its way to the social media at the onset of Navratri festival, when the first poster of the film was released. Deepika as Rani Padmini sent the Internet into a meltdown of sorts. One of the posters featured a close-up of Deepika, with several women ready to jump into the funeral pyre in the background, almost ready for jauhar (which is also the last scene of the trailer). Next, the filmmakers introduced fans to Shahid Kapoor as Maharawal Ratan Singh, Rani Padmini's husband. Ratan Singh character was introduced in the middle of a battlefield, looking determined and tensed. And finally, the moment which the Internet was waiting for - Ranveer Singh was introduced as Alauddin Khilji. Ranveer's character had unkempt hair, kohl and scared-eyes giving the actor a very scary look. In one of the poster Khilji appeared to be bathing while in the second poster he was seen looking into a mirror (Alauddin Khilji is definitely obsessed with the idea of beauty and as mirrors appear frequently in the trailer). Sanjay Leela Bhansali's Padmavati has been ostracized by Karni Sena, a Rajput community outfit, which has vowed to stop the film's release in several parts of India, including Rajasthan. Earlier, the film's shooting in Jaipur was also disrupted - sets were vandalized and Mr Bhansali was also manhandled. Padmavati is scheduled to hit the screens on December 1.